Antivirus are powerful software that protect computers from infectious programs. We have always wondered about how they work and defend computers, or prevent cyber criminals from stealing our data. We have tried to find the answers to all your questions, hence sharing our insights about the topic. So without further ado, here’s a complete guide about antivirus software and its FAQs. Listed below is a summary of topics and questions that we’re going to cover in this article. Why Windows Defender is not enough? Do antivirus provide real time protection? Do you need to update antivirus? Top 5 Antivirus programs for your Windows computer. Antivirus is a program that is created to scan, detect, prevent and remove viruses, trojans, worms, PUPs and other malicious software. They are an important part of a multi-layered security setup that secure our devices. Even smart computer users need antivirus solution to stay away from vulnerabilities while browsing and using third party applications. It protects browsers, plugins, and the entire computer ecosystem from infections. Do You Need An Antivirus Software? The answer is Yes! As long as there are computers, hackers- cyber criminals or mischievous youth, will find ways to breach your security, exploit your money, cause damage to data or just break into your system for thrill. Therefore, you need an antivirus software to safeguard your IT assets. Is Windows Defender Enough For your Computer? The answer is Nope! It’s not advisable to depend on Windows Defender for your computer’s protection. Windows Defender can only prevent 94% virus attacks whereas many other good antiviruses can easily stop 95 to 99% virus attacks. Windows Defender may evolve in future but it’s ready for now. Antivirus checks every file when you open it. It is called real time protection or on-access scanning. Once you open an executable file, your antivirus checks through its virus definitions for any known virus detections. It also performs heuristics scanning. Note:- Heuristics scan is performed to detect previously undetected viruses and new variants of the viruses. Deep or Full System Scan– It scan the whole device. It is recommended to have a deep scan for the first time after you have installed the antivirus software. Quick Scan– It scans objects loaded at startup, boot sectors in hard drive and the system memory. Generally, an antivirus runs in the background, updates itself automatically and scans every data on your device. Does Antivirus really provide RT protection? Scans Applications– The software scans program files and identifies infections if any. Scan network Shares– It scans both network shares and local folders for complete protection. Scan Inside Archives– You can add this scan if required as it slightly slows down your device. Scan Emails– It automatically scans both outgoing and incoming emails on your device. Scans Boot Sectors of your hard drive. Scans keylogger applications on your system. These application are too dangerous for your confidential data records. Scans your system as soon as important services are loaded. As discussed above, cyber criminals develop new viruses and other methods to attack your computer. Any software update especially an antivirus update immunes your system against such new attacks. See Also: How to Ensure Your Antivirus Gives You The Best Protection? Signature files consist of information about the latest viruses and other malicious software. Signature file updates happen more often and that’s why it’s recommended to setup your antivirus to “automatically update” mode to check and install antivirus updates automatically. The scan engine detects viruses with the help of signature files that are loaded into scan engine. It identifies, quarantines and removes malicious files from your computer. Scan engine updates are occasional unlike signature files but they are important. Updating the scan engine helps it run smoother and efficiently. It also decreases the number of false detections and fix build issues if any. Now let’s introduce about two major topics that are less discussed. They can help you decide the antivirus you want to buy! False positives are rare but often create problems for both users and antivirus. If a benign file is detected as a malware, it is called “false positive”. They occur due to the large amount of applications available in the market. If an antivirus identifies files behaving like malware, it will consider it as a virus. Other antivirus programs, benign third party applications, and even Windows system files can be detected as viruses. Some of the examples are Sophos identifying itself as virus, Microsoft Security Essentials detecting Google Chrome as an infection, and AVG damaging Windows 7 (64-bit). Heuristics can also cause false detections. A good antivirus rarely identifies benign files as infections. Antivirus programs have various detection rates. Detection rate depend upon the number of virus definitions a software has and effective heuristics. Antivirus companies check their products regularly to compare their detection rates with their competitors. Some companies release studies about their current detection rates and comparison with other products. Detection rates keep changing with time. Hence, there is no constant best performer in the market. To check about the best antivirus software, you need to study detection rate studies. Well, to make things easy for you, we have constructed as list of top 5 recent performers. Read on to find out who they are! It is another great security software that scans and removes malware infections from your system. Its huge malware database detects wide range of viruses, spyware, PUPs and other malware. It automatically gets updated and consists of multiple scanning modes. The product is light on system resources and does not block any programs while running in the background. The software is quick in response and execution compared to other antivirus software. Avira is a powerful security software that blocks malware, scans web browsing, and removes infections from your system. It is a centralized protection program that takes care of your computers. Bitdefender deeply scans your system to identify viruses and other malware. It utilizes behavioral detection method to identify threats for your system. With 97.8% detection rate, the antivirus quickly reacts to suspicious activities. The software has two versions- business and home edition according to its user base. The software also provides protection against malicious websites and secures your data from social engineering attacks. It is available in both free and paid versions. Download the software from here. BullGuard is an antivirus with many features. It detects malicious programs, utilizes behavioral detection technique, identifies viruses etc. With good detection rate (97.1%), it detects both known and unknown infections , has anti spam tools, and other detection features. Panda antivirus software scans files on your computers, instant messages, internet files and removes viruses from them. It also helps you create backup USB drive when your computer stops working because of malware infections. The software laos records events in its log while scanning your system. In a nutshell, Panda has got all the features that is needed in a good antivirus software. For best Mac protection software, click here. Antivirus software are complicated programs and many books can be written on the topic. 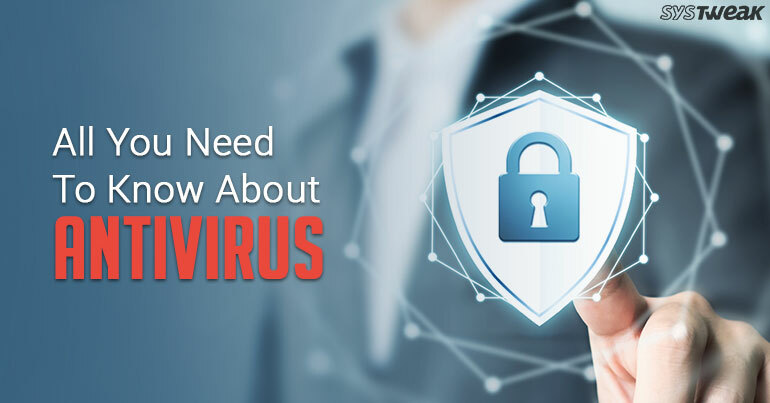 However, we have covered all the major points about antivirus and hope that the article gives a basic idea about antivirus.